I smiled when I realized that you were going to be my client’s nurse! Experience has shown me that you are something special indeed. And this birth was no different. You never left my client’s side. Unbelievable! You didn’t go to the nurse’s station and monitor from afar. I don’t think I’ve ever known a nurse who stayed in the room the whole time (except for a few quick births!). You were accommodating and patient. You held the monitors in place–I know your arms were tired! You never suggested pain medication. You gave my client confidence. Your voice was quiet. You didn’t “count to 10” with each push. Once the baby was born, you gave the new mama space to know her baby without extra distractions. You kept the lights dim. A nurse can make or break a birth experience. She can bring tension into the room or focus too much on “the way it is always done.” Or, she can remember that this birth is the first one of its kind. That this day will never be forgotten. That the birthing woman isn’t stupid or without a voice. That the birth partner is also part of the experience. Thanks Beth at Greer Memorial. You’re wonderful! Posted in Birth and tagged greer memorial hospital. Bookmark the permalink. I had two births this week at Favorite Hospital. The previous post was not at Favorite Hospital. The nurses were so wonderful. And during these births, I must have worked with at least 8 different nurses. Each spoke to me with respect and as part of the team. The birth experience for the couple goes so much more smoothly–no matter the outcome–when they can see their OB/Midwife, nurses, and doula working together and working for them. I also want to give a special thanks to Ginny–a super-nurse at Favorite Hospital–for going beyond the call of duty patient care this week. Hoorah to you, Ginny, for your emotional and physical support of couples! Posted in Doula and tagged greer memorial hospital. Bookmark the permalink. On February 18, 2008, I donated blood at the local blood connection. I randomly asked the phlebotomist, “What happens if you give blood and you are pregnant?” The response was, “You may miscarry?”. Well, you can guess that I took a test the next morning, February 19, 2008. I took a pregnancy test at 6:30 am, 7:30 am, 8:30 am, and 9:30 am. Interesting they all said that same thing, pregnant. I told my husband that night by putting a pregnancy test in the bottom of a chocolate tin. I told him I had something sweet for him. What an exciting time! We are going to be parents. 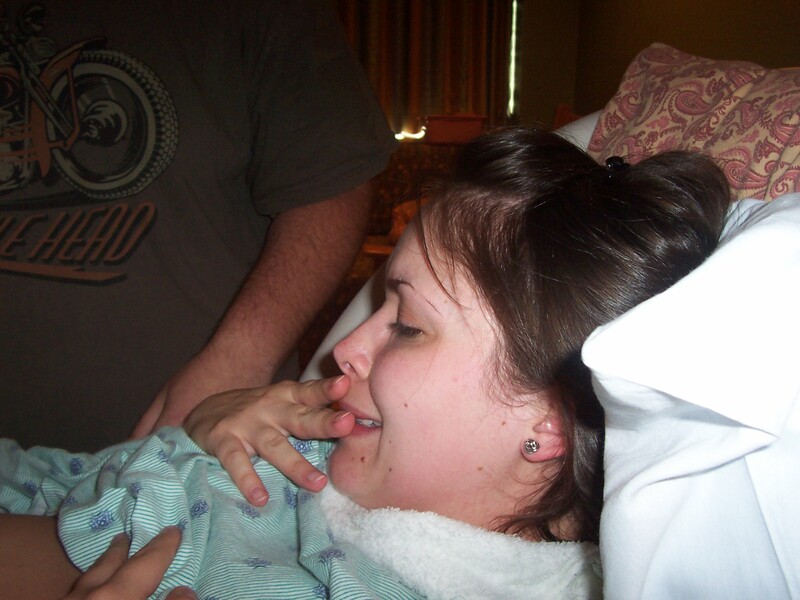 On June 9, 2008 we found out we were having a girl, wait, no a boy. The technician was in training and misread the ultrasound initially. Yeah, a little drummer boy. What a blessing to see a life growing inside you. Every precious flutter, kick, and roll made me more aware that I was going to be a mommy. We had a lot of decisions to make. One conversation was taken care of for us, finances. On March 7, 2008, we became debt free thanks to prayer and God’s gift of teaching to Dave Ramsey. The next were labor options and support. We wanted no medical intervention so I needed to find different ways to deal with the pressure waves of labor and delivery. We tossed around the idea of a birthing doula for some time. I loved the concept, but pride stepped in. My independent self didn’t want any help. My husband, the free spirit, stated that you only give birth once to this child and the doula would help us both, especially him. He had a great point since I was more nervous about his response during labor and delivery than my own. Luckily I had a friend, Julie Byers, that is a doula so I automatically felt comfortable. I also wanted to integrate hypnobirthing. My employers contract psychologist, Dr. Wood, did sessions with several fellow employees that swear by this self-hypnosis technique. You use your natural instincts to bring about a safer, easier, more comfortable birthing experience. Hypnobirthing is incorporating deep relaxation techniques where some mothers report little or no pain. Dr. Wood is very limited about what clients he takes on, but prayerfully I was one of them. Last was our OB and hospital. In the beginning we put no thought into where to birth and what doctor, but after seeing five of the OB’s at Highlands Center for Women and taking the Greenville Memorial tour, we were very troubled. We received a negative vibe with these places because they advocate medical intervention and we were afraid that our birthing plan would not be carried out at these facilities. My doula recommended Dr. Stafford and Greer Memorial. I was nervous about a male doctor since I had never seen a male doctor and I was also nervous about the drive to Greer in the urgency of labor. After much prayer and research, we felt a peace that we cannot explain so we decided to change facilities. The due date was set for October 24, 2008 and when that date rolled around and no baby, we became very disappointed, but what a time to reflect on God’s goodness. We were taught patience and trust as this little baby was 13 days post due. On the night of November 5, 2008, I was admitted to the hospital and was scheduled to begin the induction at 6:00 am on November 6, 2008. I kept telling everyone, that he would come on his own. My husband and I prayed and prayed he would. I was told if I went into labor before 6:00 am, they would cancel the pitocin. At 5:30 am, I started having contractions at 4-5 minutes apart lasting a minute. I told Russ to call our doula. When they checked me, I was at 4 cm. The pitocin was canceled. Thank you for answered prayers and what timing, thirty minutes before the dreaded pitocin. What an amazing gift we have in our bodies. God has equipped us as women with everything we need to give birth. It is not a medical emergency, but a natural process. I learned to trust my body that day. I never stayed in the bed. I moved around the room, laboring on the birthing ball, in the tub, hands and knees, and even on the toilet and leaning against the rods in the bathroom. I learned to trust others that day. My support team was amazing. My husband stood by me the entire time. He sensed my needs through every pressure wave. This time of intimacy was like no other. Our doula, was there to lead us through everything. She was very knowledgeable about natural labor and delivery, hospital procedures, and non-medical interventions (counter pressure, aromatherapy, etc). Julie would continually encourage us and the staff to stick to the birth plan. My doctor, Dr. Stafford, was like no other doctor. He is aware of the normality of birth and really has his patient’s best interest in mind. He encouraged me while I labored and pushed. He even helped hold me up while I pushed in the squatting position. He stuck to our birth plan and made sure that the nurse did as well. The nurse, Tammy, was great even though you could tell she was out of her comfort zone as she is used to her patients having an epidural, pitocin and staying in bed. 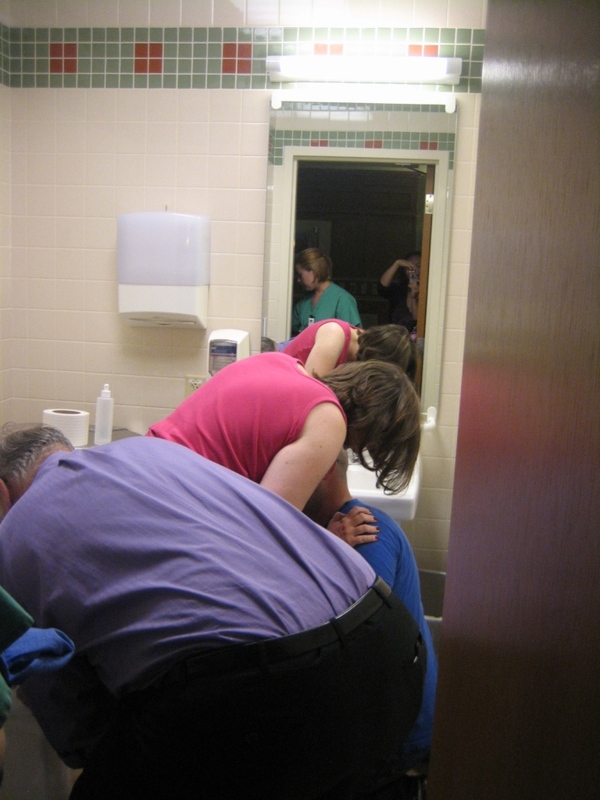 She was open to our needs and that is what patient care should really be. After 9 ½ hours of labor and 40 min of pushing we welcomed Elijah Russell Chapman to the world. He weighed 7 pounds 15 ounces and was 20 inches long. He was beautiful, perfect. What an honor to be trusted with one of God’s children. I experienced a feeling like no other that day, instant love. Special thanks to all the people who helped make this experience perfect. You will never be forgotten. I hope I do not offend anyone by my birth story. That was not my intention. The great thing about being parents is you have the opportunity to make your labor and delivery however you wish. You have to decide what is best for you and your baby. We all have the same goal and that is a healthy baby. We may just arrive there differently. 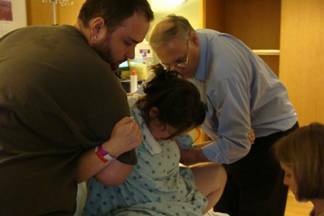 Posted in Birth, Pregnancy and tagged birth story, Cornerstone Family Medicine, Dr. Keith Stafford, greer memorial hospital, hypnobirthing. Bookmark the permalink. I had a rather unusual birth recently. A speedy birth. Four hours, in fact. The client arrived at the hospital at 9cm and had a baby an hour later. So what was unusual about this birth? The baby was posterior; born facing the sky. And none of us had any idea that was coming. Usually the first clue that a baby is posterior is long labor or prolonged pushing. Or back labor. My client had none of these. Her body must like posterior babies. Some women have an anthropoid pelvis (oblong) and handle posterior babies with ease. She pushed for only 40 minutes in the hospital “curl around yourself” semi-sitting position. I imagine this length would have been even shorter if she had been vertical or on hands and knees. My favorite part about this birth is that the baby latched on 5 minutes after birth and remained actively nursing for 20 minutes. It was beautiful. I am so proud of this strong woman who handled a hard, fast labor with ease. Posted in Birth, Breastfeeding, Doula and tagged anthropoid pelvis, Breastfeeding, childbirth, greer memorial hospital, posterior presentation, skin-to-skin. Bookmark the permalink.